Dynaudio Emit M10 review | What Hi-Fi? There was a time when Dynaudio ruled these parts. It was unstoppable, armed with a great formula for lovely listening. That was years ago, however, and while the company has consistently put out fine works, we were accustomed to more. Well, it looks like it is time for a comeback, because that’s what you get with the Dynaudio Emit M10: more. You get a bit of everything here. Versatility, transparency, energy, precision, scale and volume: you name it and the Emit 10s deliver in spades. We begin with the impressive transparency and bags of detail, which help to provide context into the performance’s environment. In a hall, on a stage, in a studio, with or without air conditioning (in the case of The Sopranos soundtrack) – it is quite apparent what sort of setting and acoustics you’re listening to, with production techniques laid bare. It’s a lively listen. The Emit M10s have a masterful grasp of rhythm, and what you get is more precise than anything offered by the B&W 685 S2s or Quad S-1s. Give them something challenging and they just lap it up. Major Lazer’s Pon de Floor is a messy obstacle course littered with varying rhythms and dynamic shifts, and these Dynaudios breeze through it with agility and panache. They’re versatile too, capable of slowing right down without missing a beat. We switch between Dusty Springfield, Nina Simone, Carl Orff’s Carmina Burana and Prince. Whether you want mischief, melancholy or menace, the Emit 10s demonstrate an impressive ability to mould themselves for any occasion. These speakers are not afraid to express themselves either. The detail and precision help with their enunciation, but you also get strong, free-flowing dynamics. If it’s a hard-hitting, passionate sound you’re after, then you’ve got it. If you want volume, you’ve got that too. You don’t need it, however – the sense of energy is always there, even at lower volumes. The Emit M10s are a compact design. 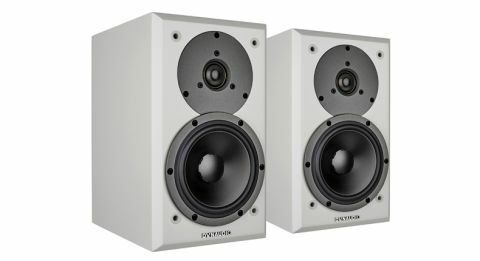 At 29cm tall they are barely bigger than the Quad S-1s, and yet they have the scale, power and dynamics to rival the larger B&W 685 S2s. It’s not just scale, but organisation too. Not only do all the instruments get plenty of space, they are also impeccably arranged in a way that gives the performance a sense of depth. And despite the wide and deep soundstage, everything works together in a cohesive unit. All of this comes naturally, like a maths prodigy bashing out trigonometry: we’re not sure how Dynaudio has done it, but we are astonished by the ease with which spectacular results have been achieved. Is there a catch to all of this? Not really. In terms of sheer scale we think the B&W 685 S2s still have the advantage, but that is of little concern when the Dynaudios are ahead in every other department. It’s not just the sound, either. We really like the look and build quality of the Emit 10s, which make the B&Ws look a little cheaply made. They’re also easy to set up (just give them some space) and unfussy with partnering equipment. We’re really struggling to say anything bad here. It may have taken a few years, but it looks like Dynaudio is back in great shape. Put it all together and you have some tremendously talented all-rounders, capable of giving out layered, intricate, versatile sound that we cannot believe only costs £500. Whether you’re starting out in hi-fi looking to upgrade, the Dynaudio Emit M10s should be on your list.